Smoke Stik receives THREE STARS and is NOT RECOMMENDED. Katherine Heigl appeared on the Late Show with David Letterman some time ago and gave an unexpected plug for the electronic cigarette industry. She and Dave were discussing their various attempts to quit smoking when she pulled out an e-cigarette. Dave was so curious he gave it a try. After taking several draws on the Smoke Stik and making some comical exhalations, Dave was impressed. “This is remarkable,” he commented. In addition to discussing the health benefits of e-cigarettes, they also spoke of the manufacturer of that particular electronic cigarette. Katherine said that hers was called a Smoke Stik. This endorsement moved us to try it out for ourselves. If you are attracted to shiny objects, Smoke Stik may be the e-cigarette for you. Katherine Heigl is not the only celebrity to have tried the Smoke Stik and given it her approval. The Smoke Stik website contains the endorsements of numerous others, such as Daniel Sunjata of Rescue Me and Audrina Patridge of The Hills. Smoke Stik e-cigarettes are distinguished by their variety of metallic finishes. Some models include jeweled tips that glow a brilliant red with each drag. If you are attracted to shiny objects, Smoke Stik may be the e-cigarette for you. The current price for Smoke Stik cartridge/atomizers is $19.95 plus shipping. They come in both Tobacco and Menthol flavors. The nicotine strengths range from 0mg to 16mg. For $20.99, you can also purchase six Skins. You slip these over the e-cigarette so that it resembles a flag from the US, Canada, Mexico or even the Confederacy. Other designs include snake skins and hearts. 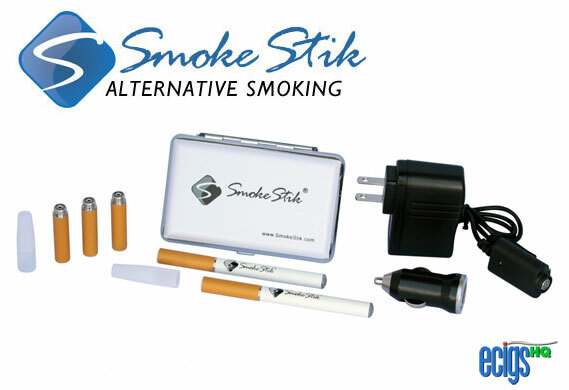 Smoke Stik’s Premium Starter Kit contains two lithium- ion batteries, each of them 2.625 inches in length. It also holds three cartridge/atomizers in the Low, High and Menthol varieties. In addition, we found a USB charger with car adaptor, an AC wall charger, the user manual and a carrying case. We were pleased to see the carrying case and the car adaptor because these extras are not usually included in starter kits. Our satisfaction with Smoke Stik ended there. After removing these items, we attached the first cartridge/atomizer to one of the batteries. Since the cartridge/atomizers are not labeled, we had no idea what the flavor would be. We were disappointed by the fruity flavor that filled our mouths and equally dissatisfied with the sad cloud of vapor that we exhaled. The other two cartridge/atomizers generated equal results. Even after trying all three, we were not sure which was Low, which was High and which was Menthol. The cartridge/atomizer that we deemed most likely to be the High variety actually leaked back into our mouths. Even after testing so many different brands of e-cigarettes, we have never had such an upsetting experience. We left the batteries to charge. The Smoke Stik starter kit is unusual because it contains three chargers. The USB and AC charger can even be used simultaneously because each is made of separate parts. Usually, you plug the battery into the USB charger which then connects to the AC adapter for the wall. The next day’s results were, unfortunately, just as upsetting. The taste was completely unlike tobacco and the plumes of vapor were mediocre at best. 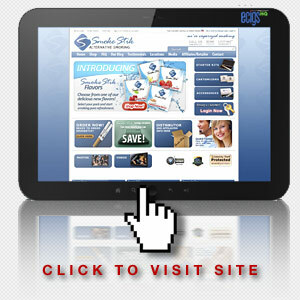 To maintain a pack-a-day habit with Smoke Stik products, you would pay $1,389.95 per year. This includes expenses associated with the starter kit. We consider this to be a poor value in an electronic cigarette. When compared to our favorite brand in this line, Smoke Stik costs more than twice as much as our favorite. The Apollo Extreme. However, you would save money if you switched from real tobacco cigarettes to this brand. A pack-per-day habit with real tobacco costs $6 a day or $2,190 per year. Switching to Smoke Stik would save you a little more than $800 over the course of a year. We deem Smoke Stik worthy of only THREE STARS and DO NOT RECOMMEND it. Click the “Visit the Official Smoke Stik Website” link below, and enter TOP5 for the coupon code at the checkout page to receive a 10% discount on your purchase.